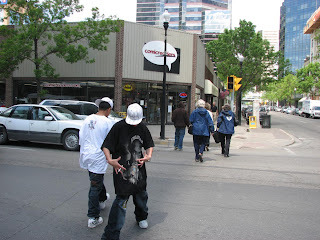 Scenes from Regina, Saskatchewan: "You want a cool picture? Here, check it!" "You want a cool picture? Here, check it!" No idea who they were, but our paths crossed several times over the course of the hour I was downtown, and they were pretty outgoing each time I saw them. What ever happened to the Army and Navy?